The surface of fly lines potentially have a great impact in making longer casts. 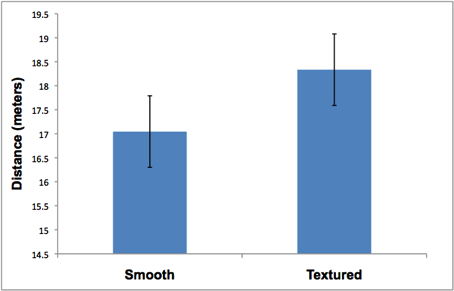 The aim of this study was to determine if a textured surface fly line would cast further than a comparable line with a smooth surface. Four recreation fly anglers were recruited to cast a Scientific Anglers textured surface fly line and its predecessor fly line with a smooth surface. On average the textured surface fly line cast 1.5m further than the fly line with the smooth surface. It seems that the lack of friction between the textured surface fly line and the guides of the fly rod does indeed result in longer casts. 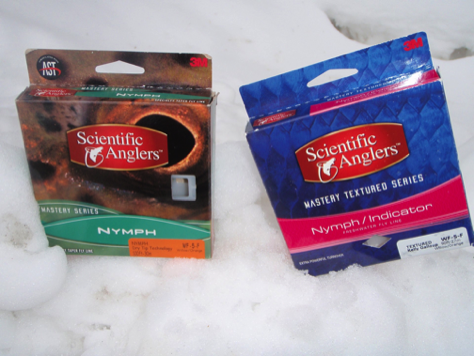 A Scientific Anglers Mastery Series Textured Nymph/indicator fly line (WF5F) was compared to its predecessor the Scientific Anglers Mastery Series Nymph/indicator (WF5F) with smooth surface. Both lines were brand new, never cast before and were directly spooled from the packaging onto the reel. Four recreational fly anglers who fish with single-handed fly rods anywhere from 10 to 30 days a year were recruited. Experience among the anglers varied from one year to as much as 20 years of fly-fishing. All participants typically use four to six weight rods when fishing for trout in both lakes and rivers. As none of the casters used the specific equipment and lines before a few minutes were allowed for practicing. Test casters were not informed about the purpose of the study and the order of casting the lines were randomized. Both fly lines were tested on three different fly rods rated by the manufacturers as 5wt 9-foot with medium-fast actions. At the end of each fly line a seven-foot tapered leader and a small piece of pink poly yarn was attached. Measurements were made using the pink poly yarn as marker. Measurements were taken of three successive casts. Test casting was performed on an indoor soccer field that is 180 feet in length. To determine if a textured line actually provides extra distance, a side by side comparison of the same line but with a smooth surface is the best approach. In the case of the Scientific Anglers Mastery Series Textured Nymph/indicator fly line (WF5F) its predecessor the Scientific Anglers Mastery Series Nymph/indicator (WF5F) is the best control under the circumstances as the exact line with a smooth surface is not available. It should be noted that the taper has changed slightly from the smooth surface line to the textured surface line. This may impact distance, but given that the taper is not a drastic change I still believe that a comparison in distance between the two lines is a worthwhile endeavour. This hold true even more so as both lines are marketed for the same purpose: nymph lines for weighted flies and strike indicators. A comparison of the textured line to the smooth line showed that among four different casters (using a variety of rods) the textured line on average will cast 1.5 metres further than the smooth line. Textured Fly Lines: Longer Casts? -A fly line with a textured surface used by the typical recreational angler will cast on average 1.5 metres further than a comparable fly line with a smooth surface. -Although the textured line did result in longer casts it did not compensate for the caster's casting ability- i.e. those who are able to make longer casts still cast further with a smooth surface fly line than a caster with the textured fly line and lesser casting skills. -The slight difference in tapers may affect the distance of the casts. -Only recreational anglers were used. -Test casting was not performed on water. -Casting was performed under controlled conditions with no wind without weighted flies or strike indicators. Different rod actions using weighted flies and/or strike may yield different results. To develop a sense of how much a textured fly line will provide additional performance, the average casting distance of three casts for each rod (n=3) per angler (n=4) was assigned a rank number from one to twelve –i.e. the longest average was ranked 1, the second longest average ranked 2 and the shortest average ranked as 12 etc. Rankings were done separately for the smooth and textured lines. The sum of these rankings for each fly line (smooth or textured) with three different rods was used to rank the casting performance for each angler (Table 1). For example if an angler's ranking was 1, 2 and 3 then the score will be 6 in Table 1, if the ranking for an angler was 9, 10 and 12 then the score would be 31. The lower the score the longer the casts by the angler with a particular fly line. Although the scores did change slightly, the rankings for the anglers did not change (Table 1). The rankings of the casters in their ability to make long casts with the smooth surfaced line were A>C>B>D and with the textured line were A>C>B>D. It seems that although the casters made longer casts with the textured lines is does not necessarily provide a competitive advantage (longer casts) if the differences in casting skills between anglers are too great. Although it does appear that angler C narrowed the gap relative to angler A. It is feasible that two anglers very close in casting skills the use of a textured fly line by one might have a competitive advantage when evaluating distance.